Findhorn Seals is all about fun! A safe and fun environment in which to build water confidence and sailing ability. 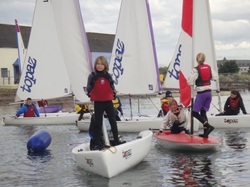 We provide basic tuition, along with lots of fun and games both on and off the water. A seals day is a fantastic way to introduce children to the World of water-sports without the pressure of a curriculum. All under the supervision of fully trained instructors who will also provide you with all safety gear and wetsuits. Bring a friend, more seals = more fun! Children should be between 8 and 16 years of age and be able to swim 50 metres. If children are unable to meet this swimming requirement due to disability please phone the centre to discuss any special needs. Gives children the confidence on the water and in a boat. Perfect for complete beginners prior to commencement of a course, as well as those looking to develop their current skills. Check the diary for course dates. we arrange courses around you.